Panna cotta is an Italian dessert made by simmering fresh cream, milk and sugar together. Gelatine is added to make it into a firm dessert. Vanilla panna cotta is the most common one as it can be served with chopped fresh fruit, chocolate or caramel sauce, fruit coulis, nuts etc. The first time I had vanilla panna cotta with strawberry sauce at an Italian restaurant Via Milano in Bangalore. I fell in love with the dessert and started my search for a recipe. I collected several but never got down to making it at home. Browsing through the tonnes of recipes collected, I came across the panna cotta recipe. I made mango panna cotta without gelatine. Its very easy to make this dessert and sets within a few hours. You can replace the mango puree with any other fruit puree. If you are going to use pineapple, use tinned ones or cook the fresh ones before you puree it. The protein digesting enzyme bromelain does not allow gelatine or agar agar to set well. I used thick yogurt instead of cream. Agar agar is basically a vegetarian gelatine obtained from a certain variety of sea weed. Its readily available in stores and health shops either in the flake form or powder form. In Kenya its sold in most stores as china grass. Put about 1½ to 2 cups of yogurt in a muslin cloth over a sieve. Leave it for about ½ hour for the water to drain out from the yogurt. You need 1 cup of thick yogurt for this recipe. Save the remaining for a salad or a smoothie. 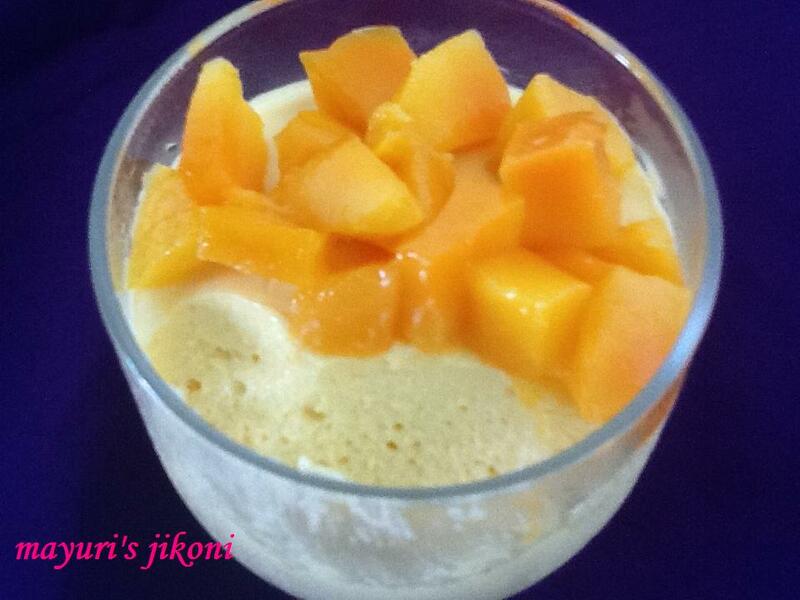 Puree the chopped mango with ¼ cup milk and leave it on the side till required. Combine milk, sugar and agar agar in a pan and leave it for 5 minutes. Heat the milk mixture and let it simmer over low heat for 6 to 8 minutes till the agar agar dissolves. Stir occasionally. Remove the pan from the heat and let it cool down for 5 minutes. Add the mango puree and process it in a blender or with a hand blender till the mixture is smooth. Add yogurt and vanilla extract. Blend it for a few seconds. Divide the mixture between 4 glasses or bowls. Cover with a cling film. Put it in the fridge for an hour to set. Leave it in the fridge till required. Top with chopped fresh fruit and serve. Can use fresh cream instead of yogurt. Just whip it lightly before adding to the mixture. Try ½ tsp ginger powder or cardamom powder instead of vanilla extract. Serve with fruits like kiwi, berries, mangoes, passion fruit etc. Serve with pureed mango on top instead of chopped fruit.